Autumn & apples go together like, well, autumn & apples. An apple is the absolute embodiment of autumn. Autumn is that perfect time of year where this primeval fruit comes alive with flavor, carpeting fields & farmland with fiery red and green as far as the eye can see. That said, this Apple & Fontina Crostini would be nothing more than an assorted collection of fruit, curdled milk, honey, and tree seeds without our Pugliese. Apples are best in autumn, but our Pugliese is best whenever they’re eaten, which is anytime from from January to December. Go ahead, prove us wrong. Preheat oven to 375ºF. Slice loaf into 1 inch-thick pieces. Spread 2 tablespoons of apple butter on each slice and place on a large baking sheet. Top with slices of Fontina cheese and bake until cheese is melted (approximately 5 minutes). 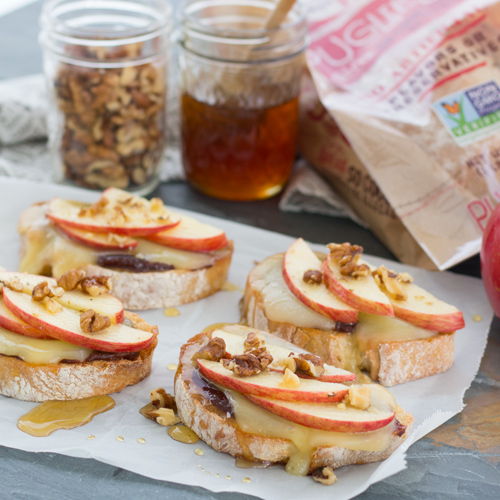 Remove crostinis from the oven and top with apple slices. Sprinkle with walnuts and drizzle with desired amount of honey.